The SMART acronym for objective and goal setting has been around for quite some time. George T. Doran used the terminology in a Management Review article in 1981. Ken Blanchard discusses SMART objectives in Leadership and the One Minute Manager and many others since have discussed the benefits of creating specific and measurable objectives. Although the words associated with some letters vary depending upon who you talk to (does "A" stand for achievable or attainable? 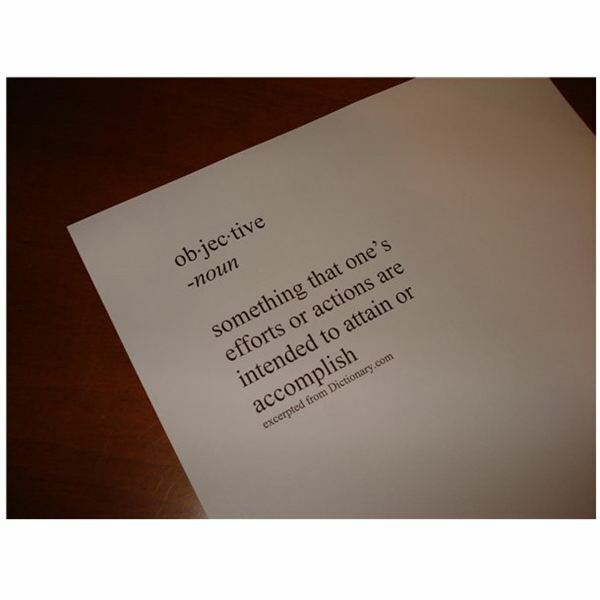 ), all parties agree that well-written objectives help you reach the ultimate goal. With respect to goals versus objectives, this article focuses on SMART objectives. However, the criteria are applicable to goals too. Objectives can be defined as significant tasks needed to reach a goal or long-term strategy. A goal is the desired final outcome. An objective is more specific than a goal. And, many objectives may be needed to reach a goal. SMART objectives were initially associated with project management theory. But, SMART criteria are also useful in developing job-related objectives and personal goals. We will focus on a project in this article. In order to work with an example, let me disclose that I would love to publish a fabulous cookbook that will make lots of money. This is a someday goal and a very poorly worded one at that. Several objectives are needed to accomplish this vague desire. Read on to learn the requirements of a SMART objective and to see an important objective developed for my cookbook. An objective should be quantitatively or descriptively measurable. Create a mechanism to track progress in meeting the objective. In my cookbook example, I want to write 100 recipes. An objective should be achievable or attainable given the resources for the project. It should require effort to reach the objective (or else why set one at all? ), but it should not be so far-reaching that you will become frustrated. In the cookbook example, I will need to consider my expertise (I used to have a meal assembly business) and other commitments (kids, other writing assignments) in setting an objective. An objective should be relevant or aligned with goals or larger strategies. Now that I am no longer actively developing recipes for my business and pursuing a writing career instead, does it make sense to focus on a cookbook? Attach a deadline for completion to your objective so a call to action is clear. The deadline creates a sense of urgency. I may never get around to writing my cookbook if I don’t set a deadline. Write 100 entree recipes that can be made ahead and frozen in a personal kitchen for inclusion in a cookbook by December 31st. I will need a few more objectives and a SMART goal to round out my planning.